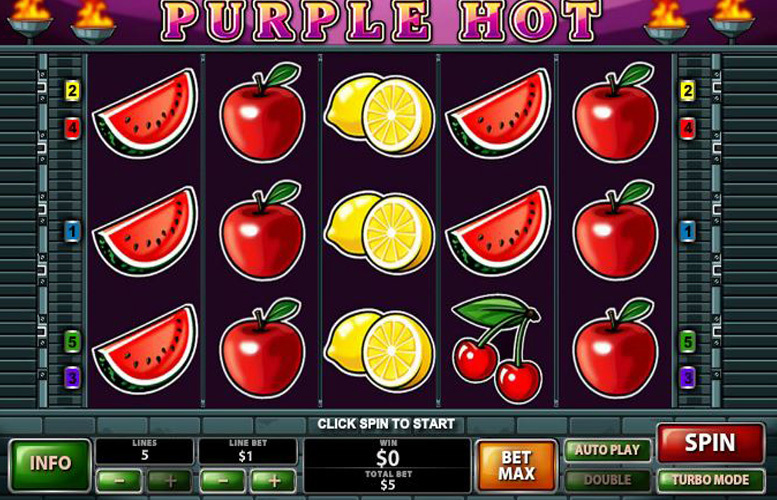 The Purple Hot slot machine from Playtech is ideal for those who like their gaming to be simple, and without too much flash. It uses classic casino imagery, and has a nice colour scheme, even if the animation is a little basic. The slot has just five win lines, five reels, and three rows. Its main feature however, is the progressive jackpots that can be won. More on that later. Overall, the game is a little too basic for many tastes. That said, if simple is your thing, this one may be for you. Potential to win lifechanging money. The progressive jackpots can reach astronomical figures – we’re talking five or six figures here. Those who like their action to be simple, and no-nonsense will enjoy Purple Hot. Game feature certainly appeals to some players. Potentially overly simplistic. They could include some free spins, or some other more exciting feature. Just five win lines. It’s hard to understand why this decision was made but it was certainly a poor one. There isn’t even a “wild” symbol. It’s really that old-school. 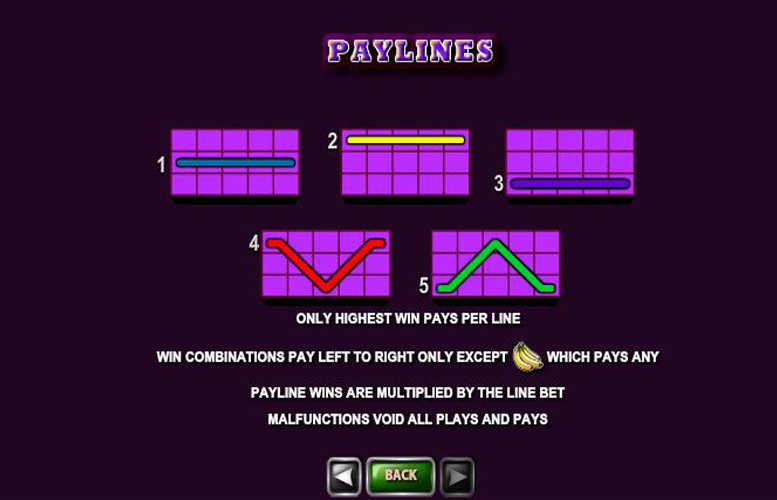 Lucky 7 = 5,000x the line bet (if players are not eligible for progressive jackpots). Apple, or Orange = 500x the line bet. Grapes, Lemons, or Watermelons = 200x the line bet. Banana = 5x the line bet. 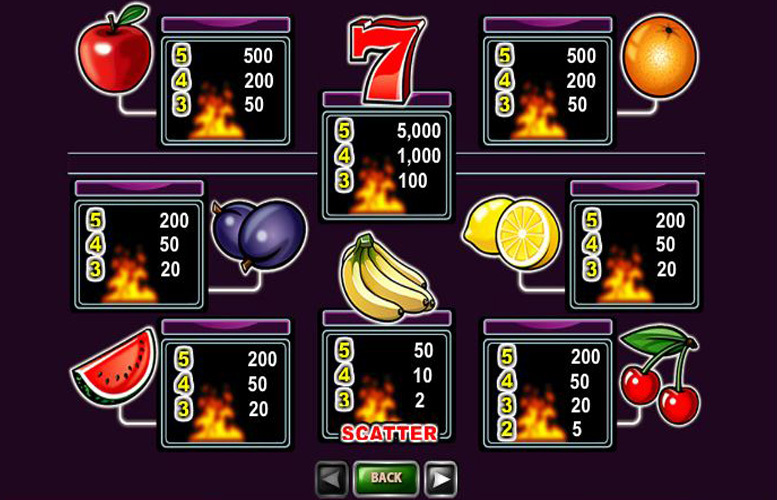 Hitting five-of-a-kind Lucky 7s across a pay line wins the progressive jackpot. To qualify, players must play all possible pay lines. There are also different levels of jackpots, depending on the size of the bet placed. £2, £5, £10, £25 bets will all be awarded a different sized prize. After every win, players are given the opportunity to double their winnings by gambling against the house. The goal is to pick a higher card than the dealer. You’re presented with five cards, and the leftmost one is the dealers. You decide the amount you wish to gamble. The options are either a full double (bet all your winnings), and a half double up (bet half of your winnings). Once you’ve selected how much to bet, the dealer reveals their card. You must then select from those than remain. You can also use the “collect” option at any point to return to the game with whatever is in your gamble balance. You can continue to double up until you reach an impressive £5,000. Losing a bet at any point returns you to the main game with whatever winnings you might have. Players can adjust the number of win lines the use per spin. The highest possible is just five, whilst the lowest is one. They can also alter the amount bet per line. The maximum here is £5, and the minimum a penny. This makes the largest possible bet per spin on Purple Hot £25, and the smallest just 1p. Purple Hot is just too basic for many gamblers these days. It’s 2017, we’ve got insanely advanced video slot machines with cutting edge cinematics, and fully interactive bonus rounds. I can understand the charm of a simple machine, but there isn’t even that much character to enjoy with this one. It’s basically all about the “double-up” card game, and the progressive jackpot. However, there will be people out there who absolutely adore stripped back bandits, and for them, Purple Hot might be the perfect title.